Sales of American and Western art hit new highs this spring at Sotheby’s and Christie’s, sending ripples of excitement through the market and a sense that the best is yet to come. The buildup began in May with the Sotheby’s sale of Jean-Michel Basquiat’s Untitled (1982) which went for millions of dollars more than predicted. The painting’s ultimate price — $110.5 million — represents the most brought at auction for an American artist, according to the auction house, and a coup of sorts for art lovers everywhere who believe the underpinning of any civilized society is tied to great works that trace the highest arcs of imagination, intelligence and intention. There was hardly a beat before Sotheby’s followed up May 21 with an American art sale that saw a Norman Rockwell — Two Plumbers — fetch almost $15 million, more than double its high-end, pre-sale estimate. Just two days later, Christie’s weighed in with a world auction record for Frederic Remington. Coming Through the Rye, a bronze featuring four shoot-em-up cowboys, brought $11.2 million in a sale that underscores what Will Haydock, head of American art for Christie’s, says is resurgent market demand for sculpture. Where Remington and Rockwell lead, Native American artifacts and Americana are sure to follow. Bonhams in June saw rare works by indigenous artists sell for amounts far above their pre-sale estimates, even as Brian Lebel’s Old West Auction sold finely crafted cowboy trappings such as Bob Boone spurs for tens of thousands of dollars. Events tied to museums like the Phippen in Prescott, Arizona, likewise showed renewed enthusiasm for all items Western. This year’s edition of the museum’s annual Western Art Show & Sale aligned established artists with newcomers to bolster buying options for the hundreds who attended the series of events that spanned Memorial Day weekend. American abstract expressionists were front and center this spring at Los Angeles Modern Auctions (LAMA), where a symphony of color in poured paint hammered for nearly two times its low-range, pre-sale estimate. Phenomena Wind at the Foot of the Anvil by Paul Jenkins went for $75,000, which LAMA Director Peter Loughrey declared a bargain for an artist he considers underappreciated for too long. While sales of Western works and American art so far for 2017 have buoyed expectations among auction officials and gallerists, several experts said they are still seeking to crack the code that will boost the number of international buyers. Christie’s Haydock says the auction house is making a concerted effort to expand the market in Asia, widening the narrow base of American artists — including Georgia O’Keeffe and Edward Hopper — with name and brand recognition. Also achieving a sum far above its estimate was a depiction on muslin of American Indian warriors on horseback. The almost mystical representation of a successful raid by head-dressed victors makes use of colored ink and colored ink wash; the Plains pictorial muslin sold for $30,000, more than twice its low, pre-sale estimate, Bonhams says. A blackware storage jar tied to the San Ildefonso Pueblo in modern-day New Mexico fetched $23,750, or nearly $9,000 more than expected. The work is associated with a site which is on the National Register of Historic Places in recognition of its historical and cultural significance and its key role in the revival of pueblo ceramics, according to the U.S. Park Service. The auction realized a total of $689,000 for 210 lots, according to Bonhams. A roughly equal share of live bidders and those bidding online and by phone — for a crowd of more than 600 — attended Brian Lebel’s Old West Auction on June 10 in Fort Worth, Texas, where the highest selling lot was a small but evocative watercolor by American frontier artist Alfred Jacob Miller, auction officials say. Beating a Retreat, Miller’s depiction of Native Americans on horseback dodging the arrows of enemy warriors, sold for $141,600, a happy outcome in a sale that finds its strength in cowboy and American Indian artifacts as well as Americana items. The auction saw a one-of-a-kind pair of Bob Boone spurs go for a heady $41,300, more than double its low-end estimate, and a Colt revolver used by actress Gail Davis in her portrayal of Annie Oakley was snapped up by a phone bidder for $10,030, five times its low estimate. Auction owner Brian Lebel says the event brought an increase in bidders compared to last year’s sale, an uptick he attributed to the variety of material offered. “This was one of those auctions where there was a little bit of everything, in all prices ranges no less. That keeps it interesting for people,” he says in a statement. The auction brought a total of nearly $1 million and boasted a sell-through rate of 94 percent. 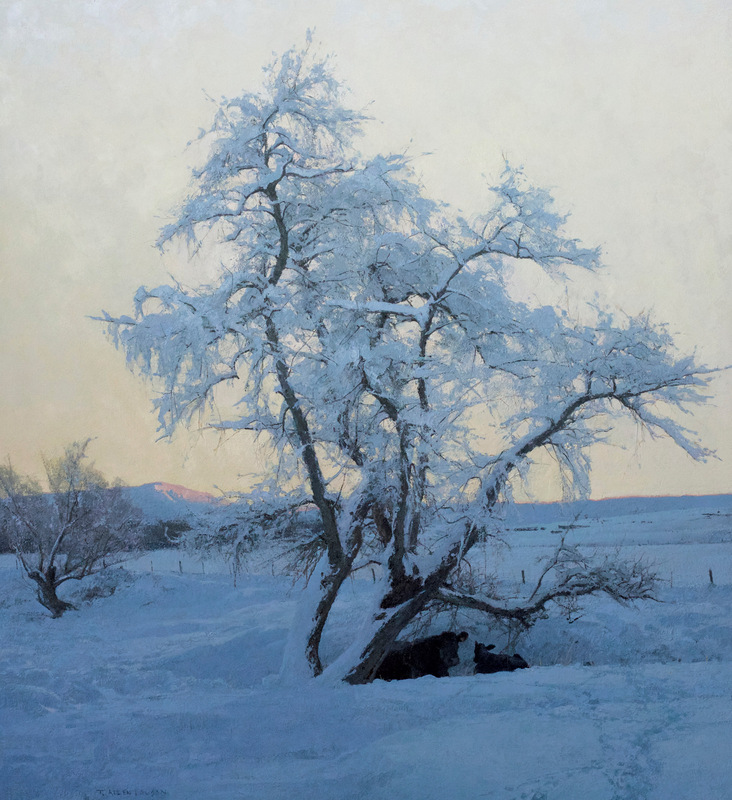 Wyoming artist T. Allen Lawson gained the highest honor with his painting, The Nursery Tree, purchased for $48,000 on behalf of the National Cowboy & Western Heritage Museum during its celebrated Prix de West art event. The painting, which depicts a tree weighted with snow and ice, is to be added to the permanent collection at the Oklahoma City-based museum. The oil was one of three that led Lawson to gain the Robert Lougheed Memorial Award during an opening weekend June 9 to 10 that generated more than $3.1 million in art sales and drew more than 700 guests, according to the museum. The top seller at $185,000 was Compilation of the Gods, a sweeping oil by Curt Walters that captures the ethereal light and ever-changing moods of the Grand Canyon. The painting, all but an homage to nature itself, won the Jackie L. Coles Buyer’s Choice Award. Other honorees were: George Hallmark’s A Father’s Gift, winner of the Frederic Remington Painting Award; Greg Beecham’s Trailing Caribou’s Ghost, winner of the Major General and Mrs. Don Pittman Wildlife Art Award; Steve Kestrel’s Tailspin, winner of the James Earle Fraser Sculpture Award; T.D. Kelsey’s Over the Dashboard, winner of the Express Ranches Great American Cowboy Award; Skip Whitcomb’s Morning Light Show, winner of the Donald Teague Memorial Award; and Len Chmiel’s Transparent Water Colors, winner of the Wilson Hurley Award for Outstanding Landscape. The Memorial Day weekend art extravaganza benefit for the Phippen Museum in Prescott, Arizona, showcased the work of nearly 100 artist, those up-and-coming and established, including Edward Aldrich, Donna Howell-Sickles, Bill Nebeker and Tim Shinabarger. This year’s Western Art Show & Sale, which included an annual gala known as Denim to Diamonds, and which takes place in downtown Prescott, saw the entry of Kyle Ma, a teenager from Austin, Texas, who has gained a raft of art awards in the past couple years. Ma’s Nature’s Calling brought $950 during sales of so-called miniature masterpieces. Other small-sized works that drew buyers included Aldrich’s A Bear’s Realm, which went for $1,200, and Shinabarger’s sculpture, Wapiti, which was snapped up for $745. Frank Serrano, who, like Ma, was a newcomer to the event, turned in a nocturne in the tradition of Frank Tenney Johnson, with the depiction of a lone cowboy and his horse entitled Leaving Camp. And Cody DeLong, an artist claimed as a local by the museum in Arizona’s central highlands, submitted Cathedral in the Heat, a miniature painting that captured the texture and quality of light as it can only play in the towering formations of the desert Southwest. Edd Kellerman, marketing and communications manager for the museum, says the 43rd anniversary of the event brought broader artist participation and greater audience approbation. “I think it’s the most outstanding year we’ve had,” he says. One reason may be that museum curator Lynette Tritel successfully sought to expand artist styles, media and profiles to fit different types of buyers whose spending allowances vary. “We need a price point for different collectors,” she says. Honorees included: Joseph Robertson for his mixed-media portrait Grand Canyon Bull, which netted Best of Show; Valeriy Kagounkin, who gained the Phippen Foundation Award for her work Hot Day in the Pen; and Kathy Quick Anderson, who captured the Phippen Family Award with Hit or Miss, an evocative oil depicting two cowboys on horseback in rugged mountain country. An iconic bronze by iconic Western artist Frederic Remington soared to $11.2 million as two bidders vied for possession of Coming Through the Rye during Christie’s sale of American art May 23 in New York City. The sculpture, one of several that sold high during an event that brought a total of more than $41 million, achieved a world auction record for an artist considered one of the fathers of Western art, and also marked a record for American sculpture before World War I, according to Christie’s. The Remington, whose pre-sale estimate ranged from $7 to $10 million, was destined to excite interest, says Will Haydock, head of American art for the international auction house. 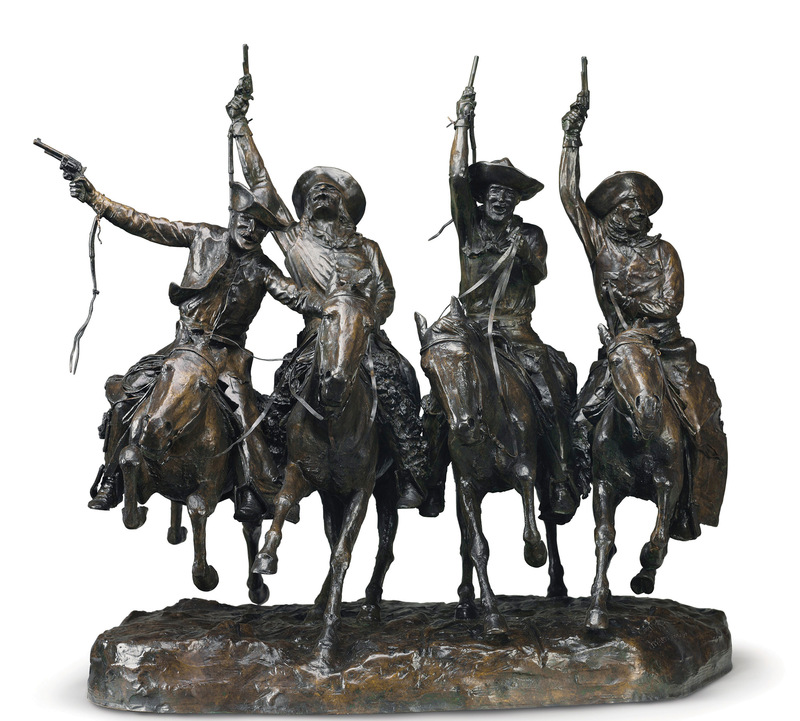 He says factors that played into pricing the bronze included the fact that there was very little expectation of another example of the sculpture — which depicts four mounted cowboys shooting into the air in an act of sheer exuberance — coming to market any time soon. In a sign of sculpture’s resurgence, a lyrical bronze by Paul Manship, Dancer and Gazelles, fetched $967,500, or nearly twice its top, pre-sale estimate, while drawing admiration from a raft of collectors. “There was a lot of enthusiasm in the marketplace for this material,” says Haydock. He added that the bronze served as a perfect case study for market growth in that it brought more than double the amount that the 32.5-inch sculpture achieved when sold several years ago by a smaller auction house. Further evidence of what Haydock described as high-market demand for superlative sculpture was the world auction record set for Augustus Saint-Gaudens with the sale of the figurative Victory. The piece, one of eight known reductions of a figure in the monumental statuary group in New York City that is dedicated to Civil War General William Tecumseh Sherman, soared past its top, pre-sale estimate to fetch more than $2 million, according to Christie’s. Two oils by Albert Bierstadt, best known for his expansive landscapes of the American West, gained slots in the top 10 bestsellers for the May 23 auction, notably Twilight, Lake Tahoe, which went for more than $3.2 million — or just above the low range of the pre-sale estimate — and Mount Hood, Oregon, which brought $1,567,500. In a first, Christie’s online sale of American art began in advance of its live sale and overlapped it in a trial that Haydock said yielded desired results. The online event stretched from May 17 to May 24 and achieved a total of $3,169,000, or the second largest amount on record for the auction house’s online sale. Sotheby’s had a banner spring, beginning with the sale on May 18 of a painting that fetched the most money at auction for an American artist and continuing on May 21 with a Norman Rockwell that went for nearly $15 million, or two times its high, pre-sale estimate. The auction house’s May 18 sale of contemporary art augured virtually no second act after a stunning work by Jean-Michel Basquiat — Untitled (1982) — achieved $110.5 million, surpassing records for the late artist and for any artwork created after 1980, according to Sotheby’s. The outsized piece, dominated by a skull-like head on a canvas marked in acrylic, oilstick and spray paint, is described by the auction house as “raw, uncensored and fiercely magnificent” — and that’s an understatement. Just three days later, a bidding war between two telephone collectors lasted seven intense minutes before Rockwell’s Two Plumbers fetched $14,975,000, joining the ranks of the top four auction prices for an artist who captured Americans over five 20th century decades on covers of The Saturday Evening Post, and captivated art lovers for all time. Considered by Sotheby’s to be one of Rockwell’s most beloved, humor-edged images, Two Plumbers, an oil produced in 1951, was last auctioned by Sotheby’s in 1996 for $882,500. Rockwell paintings took both the number one and number two slots during the American art sale May 21 that saw 87 works garner a total of more than $33 million. A Georgia O’Keeffe that demonstrated her spare, Southwest style to perfection brought $972,500, with Turkey Feathers and Indian Pot, an ode in oil to the pairing of the fan-like ornamentation of a native bird with an ornament fashioned by an indigenous artist. Landscape, New Mexico, a 1923 painting that acts as a testimony to Marsden Hartley’s artistic awakening in that same American Southwest and which is awash with Post-Impressionist flourishes, fetched $852,500 to gain the number six slot in the sale’s top 10 lots, according to Sotheby’s. A subtle rendering of pure color poured with precision over canvas capped the rising sales Los Angeles Modern Auctions (LAMA) has overseen for works by the late abstract artist Paul Jenkins. The large-scale painting, Phenomena Wind at the Foot of the Anvil, brought $75,000 at the Modern Art and Design Auction in Los Angeles, which compares to pre-sale estimates ranging from $35,000 to $45,000. Jenkins’ works commanded the approval of collectors and critics alike during his lifetime but prices remained relatively low. His pieces in recent years have seen amounts rise amid sales at LAMA, where Loughrey champions the artist. “Jenkins is every bit as good as the school of artists working in this vocabulary, yet he’s been historically under appreciated,” he says. In addition to its artistry — including a technique which Loughrey likened to using gravity as a paintbrush in the pouring of paint on a thinly treated canvas — Phenomena stands out for its color combinations and, conversely, for its way with white. Loughrey says it is difficult to find a near flawless surface such as the one possessed by Phenomena, in which white is so extensively used. “A canvas that is generally white and without varnish can pick up scuff marks or fingerprints or any sort of smudge that makes it objectionable to the viewer,” he says. A similarly alluring example of a piece that represents an artist’s mastery of a given style was the sale by LAMA of a four-faced vase by Pablo Picasso. The artist discovered ceramics in his 50s and returned to that medium in his 90s with a newfound passion, says Loughrey. The vase, featuring an Aztec motif and four aspects of what is believed to be a female face, brought $81,250, which compares to a pre-sale range of $50,000 to $70,000. The piece, fashioned in white earthenware clay, is large in size and complex in design. It also underscores Picasso’s ongoing interest and exploration of the face, which played an important role in his work, says Loughrey. The number of collectors attracted to the work and its ultimate price indicate the market is hungry for such representative works, especially when they are low in edition number (this one is number 19 of 100) and make statements with size and form, he says. The vase was consigned by a Los Angeles collector who in the 1950s and 1960s purchased Picasso ceramics from galleries. The timing of the sale of the vase this spring coincided with steadily climbing prices for such works by Picasso, with the amounts they fetched just five years ago about one-fifth of the prices they can bring today, says Loughrey.